From paintings, prints and posters to sculptures, jewelry and tattoos, ying yang art is popular in many different art forms. The flowing lines of the ying yang, also known as yin yang, as they seamlessly meld into one another becoming one, represent the duality in all things of the universe. 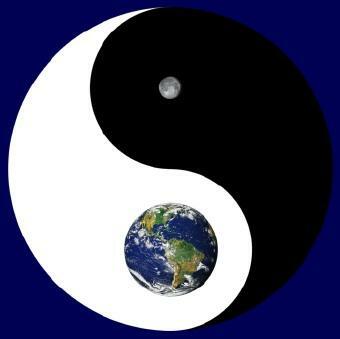 The yin yang symbol has been a popular subject for artists for many decades. Although the classic symbol of the yin yang is black and white, artistic versions are created in many different color combinations, designs and styles. 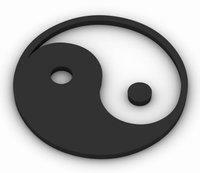 The yin yang symbol lends itself perfectly to the imagery and creativity of an artist's mind. Whether the artist works in a traditional medium or is one of the growing numbers of digital artists, each spectacular creation is unique and thought provoking. Watch a Yin Yang slideshow! Many exquisite versions of the yin yang are portrayed on paintings, prints and posters. Others are formed as sculptors carve and polish their pieces and jewelry artisans form precious metals and gemstones into striking works of art. Yin yang designs are also popular with tattoo artists as they apply their craft creating stunning images of this meaningful symbol on their living canvasses. Yin-Yang by renowned artist Jim Thompson, is a beautiful computer generated digital work of art featuring a conceptual version of a yin yang showing the eternal cycle of life. This exquisite digital painting is a limited edition of 400 prints, each one signed and numbered and is available at The Art, Mind and Soul of Jim Thompson . An exquisite modernistic oil painting, yin yang mandala by Moira Gil is available as a print. A striking classic yin yang, mirror image dragons and stunning colors screen-printed onto a fabric that is sheer and beautiful make this fabric poster from All Posters stand out as a true work of art. The dark side is portrayed in this Alchemy Gothic Poster where the yin yang represents life and death from Movie Poster. A bronze sculpture titled Yin and Yang by Renater Stendar a Swiss artist. Two contemporary yin yang sculptures by Chinese sculptor Zhang Yaxi, the top one on the page is created from black marble and the bottom one is created from wood. The artist also offers a limited edition of eight of these sculptures in bronze. A stunning stone sculpture by artist Prabin Karki.is known as Yin-Yang and Bird in Flight. Scroll down past the article to view the sculpture. Dolphins form part of the outer circle of this artistic tattoo from 1001 tattoos. The website also offers nine additional art tattoos. Ying yang art is not only beautiful; it is rich with imagery, symbolism and meaning.